Uruguay might be an exotic spot on the global techno map but because of George Paar, the founder of Par Recordings, it’s not a quiet place. The Montevideo resident has been running the label since 2011, as a publishing platform of his own tracks along with guest contributions from Ness, Patrick Krieger, Conrad van Orton and most recently Giorgio Gigli. 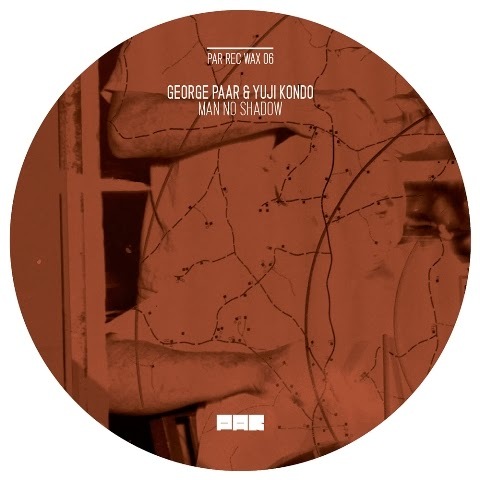 Now hard-working Yuji Kondo from Japan has joined the label head in “Man No Shadow EP” for the sixth vinyl release. The A-side sees Paar’s furious programming in mechanical and intense “Modern Inception” and the embrace of cold-hearted machines continues in “Dwelling In Ignorance”, rushed over by a giant wave of pulsating stabs. The B-side belongs to Kondo, starting with crawling and rattling “Indefinitely Discreet” for feeling disoriented like in high fever, and then topped by well-targeted kick and uncanny whispers in physically challenging “Know Where”, a linear and revolting tool for the partygoers.